That brings another week in the Siambr to a close. Senedd Live returns on Tuesday 13 February. The topic chosen by Caroline Jones (South Wales West) for the Short Debate is the role of community hospitals in 21st century healthcare. 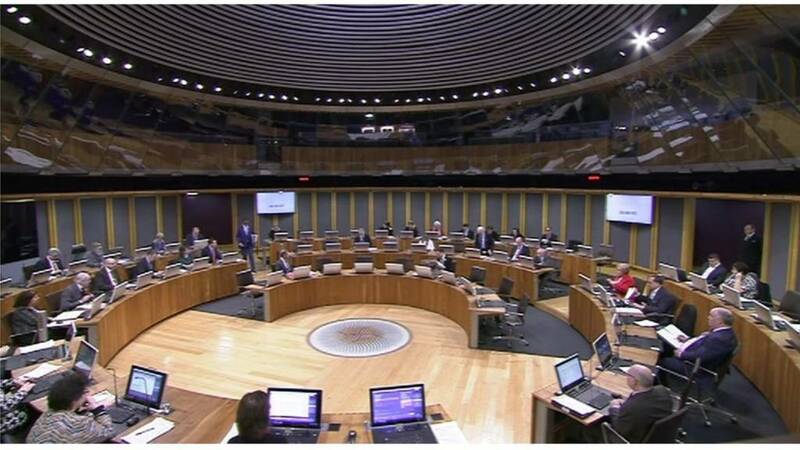 "Resolves that the Welsh Government should not commit to financing the proposed M4 relief road without a meaningful vote on a substantive motion in the Assembly following the conclusion of the current public inquiry"
is defeated, with 26 for and 28 against. The UKIP motion on Assembly electoral reform is amended by AMs to simply note the Expert Panel on Assembly Electoral Reform's report entitled 'A Parliament that works for Wales'. UKIP's Gareth Bennett says AMs, "living in a political bubble", should be more "creative" rather than calling for more AMs. For example, he says "a lot of the assembly's committee work is unnecessary". The topic chosen for the United Kingdom Independence Party debate is Assembly electoral reform. The party believes that "there should be no increase in the number of the Assembly's elected members, and the electorate must demonstrate their consent to any future increase in the number of elected members by way of a referendum". "Recognises that a public inquiry by independent inspectors into the M4 corridor around Newport project is still underway and nothing should be done to prejudice the outcome of the inquiry, the inspectors' report or the statutory process." Economy Secretary Ken Skates says on finance, "the public inquiry will be allowed to report before any allocation decisions are made, and these allocation decision will be reported to the National Assembly, and where they need the approval of the National Assembly in subsequent budgets that approval must and will be sought". Llanelli Labour AM Lee Waters says "I want to kill this road, but I don't want to play games around it", referring to Adam Price's hope that Plaid Cymru and the Welsh Conservatives could work together over the issue of the proposed M4 relief road. Labour AM for Pontypridd, Mick Antoniw calls for a debate and vote on the proposed M4 relief road because it has "very significant implications for all our other commitments." For example, he says "I don't want the South Wales Metro to be the equivalent of the Loch Ness Monster, that everyone has heard of it but nobody seen it". UKIP's David Rowlands urges the Welsh Government "to allow the vote, because if something does go wrong with this huge project the whole of the chamber could be held culpable". Jenny Rathbone says she remains "unconvinced this is the best way of spending £1.5 billion". She calls for a substantive debate in government time. In 2015 she said there was an "unhealthy culture" at the top of the Welsh Government that stopped AMs from speaking out against the proposed road around Newport. Andrew RT Davies says the Conservatives support the "reasonable" Plaid Cymru proposal, especially considering the proposed M4 relief road is the biggest infrastructure project in Wales since devolution, with "escalating costs". Plaid Cymru's Adam Price says "it is only right and proper" that there should be a vote in the Assembly on the M4 relief road at the conclusion of the public inquiry, especially given the level of expenditure. "It's parliaments that should decide on major policy decisions", he says. One member who will not be contributing to this debate as he is now a cabinet secretary is Alun Davies, but he made his view clear when he spoke out following the sacking of his colleague Jenny Rathbone as a committee chair in 2015 after she criticised the Welsh government for spending nearly £20m on M4 relief road plans. Mr Davies said at the time: "It is to me astonishing that a government that is committed to reducing poverty, will spend a billion pounds of public money on a project that will have no economic impact on my constituents, and very little economic impact in some of the poorest parts of the country." The topic chosen for the Plaid Cymru debate is the proposed M4 relief road. Plaid Cymru's proposal is that the assembly "resolves that the Welsh Government should not commit to financing the proposed M4 relief road without a meaningful vote on a substantive motion in the Assembly following the conclusion of the current public inquiry". Cynon Valley AM Vikki Howells says that in 2010 Wales was the first country in the world to legislate on children’s play, although she points out the law that was passed did not include any specific provisions relating to accessible playground provision. She says she has seen good examples of local authorities putting in place measures to ensure their play areas are inclusive, such as the work carried out by Rhondda Cynon Taf council in Cilfynydd. However, she believes there is "still an insufficiency of opportunities for disabled children and young people to play safely, securely and with their needs being met". The next item is a debate on a Member's Legislative Proposal. Vikki Howells (Cynon Valley) explains that the purpose of an inclusive play Bill "would be to improve inclusive play opportunities by placing a duty on local authorities so that they must provide play equipment that meet the needs of children with disabilities". AMs approve "the Assembly Commission’s decision to consult on the Panel’s proposals and other electoral, franchise and internal reforms made possible by the Wales Act 2017". Any changes will require a law to be passed in the assembly with a two-thirds majority. AMs were given powers to make changes to the way they are elected under the 2017 Wales Act. The panel also recommended a change in the voting system, to a proportional method called the Single Transferable Vote. One option would be to pair the current 40 constituencies to merge them into 20 seats, each with four AMs, giving a total of 80. We move on to a discussion on the report of the Expert Panel on Assembly Electoral Reform. The Welsh Assembly needs an extra 20 to 30 members to cope with its growing workload, the panel said. Its report also recommends that 16 and 17-year-olds should be able to vote in assembly elections. Prof Laura McAllister of Cardiff University, who chaired the panel.Image caption: Prof Laura McAllister of Cardiff University, who chaired the panel.